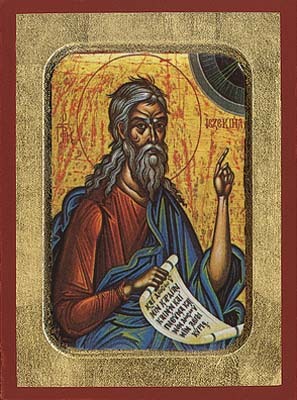 The Holy Prophet Ezekiel lived in the sixth century before the birth of Christ. He was born in the city of Sarir, and descended from the tribe of Levi ; he was a priest and the son of the priest Buzi. Ezekiel was led off to Babylon when he was twenty-five years old together with King Jechoniah II and many other Jews during the second invasion of Jerusalem by the Babylonian king Nebuchadnessar . According to the explanation of the Fathers of the Church, the human likeness upon the sapphire throne prefigures the Incarnation of the Son of God from the Most Holy Virgin Mary, who is the living Throne of God. The four creatures are symbols of the four Evangelists: a man (St Matthew), a lion (St Mark), an ox (St Luke), and an eagle (St John); the wheel with the many eyes is meant to suggest the sharing of light with all the nations of the earth. During this vision the holy prophet fell down upon the ground out of fear, but the voice of God commanded him to get up. He was told that the Lord was sending him to preach to the nation of Israel. This was the begining of Ezekiel's prophetic service. There are two significant elements in the vision of the prophet: the vision of the temple of the Lord, full of glory (Ez. 44:1-10); and the bones in the valley, to which the Spirit of God gave new life (Ez. 37:1-14). The vision of the temple was a mysterious prefiguring of the race of man freed from the working of the Enemy and the building up of the Church of Christ through the redemptive act of the Son of God, incarnate of the Most Holy Theotokos. Ezekiel's description of the shut gate of the sanctuary, through which the Lord God would enter (Ez. 44: 2), is a prophecy of the Virgin giving birth to Christ, yet remaining a virgin. The vision of the dry bones prefigured the universal resurrection of the dead, and the new eternal life bestowed by the Lord Jesus Christ. 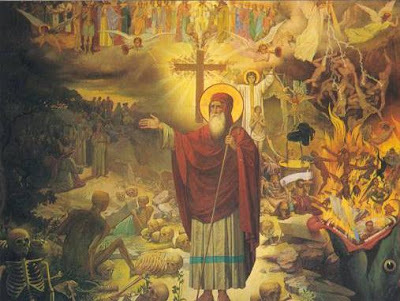 St Demetrius of Rostov (October 28 and September 21) explains to believers the following concepts in the book of the Prophet Ezekiel: if a righteous man turns from righteousness to sin, he shall die for his sin, and his righteouness will not be remembered. If a sinner repents, and keeps God's commandments, he will not die. His former sins will not be held against him, beause now he follows the path of righteousness (Ez. 3:20; 18:21-24). 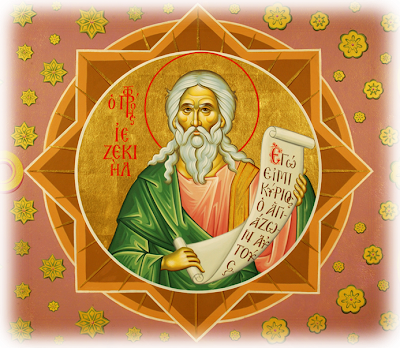 As we celebrate the memory of Thy Prophet Ezekiel, O Lord, through him we beseech Thee to save our souls. O divine Ezekiel, as God's true Prophet, thou foretoldest unto all the Incarnation of the Lord, the Lamb of God, the Artificer, the Son of God, the Eternal made manifest.